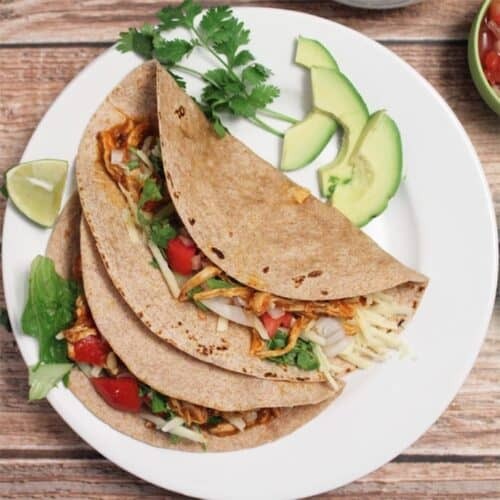 Chicken Tinga is an authentic Mexican dish made with shredded chicken in a smoky & spicy chipotle adobo sauce. Serve on tortillas for dinner or a sub roll for lunch. Place all ingredients in a large pot. Add chicken broth and enough water to cover all ingredients. Do not cover! Bring to a boil. After 30 minutes, remove chicken and shred. Continue to cook remainder of ingredients for another 20-30 minutes. Now you want to puree the mixture by either using an immersion blender or placing the mixture in batches in a blender. Place mixture back in pot and cook for another hour. This will help thicken the sauce. When you have about 10 minutes left, return the shredded chicken to the pot and let it finish cooking. Serve with tortillas, over rice or on a sandwich roll. I also found it delicious in quesadillas. WARNING: You do not want to fill the blender too full of hot liquid as it could explode. Process in batches.